A property owner has been fined £18,000 for failing to get rid of an invasive plant in the garden of a Bristol house. 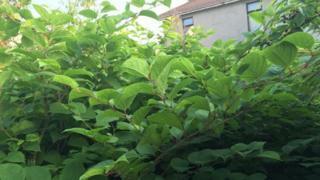 Bristol City Council prosecuted MB Estate Limited which owns the house in Horfield where Japanese knotweed was growing. The council acted for seven homeowners whose properties were affected by the plant which can grow through foundations. The BBC has been unable to contact the company for comment. Amie King bought her house in Ash Road in 2007. She noticed "big green plants growing next door" which were about eight feet high but did not know what it was. Is there knotweed in my neighbourhood? The plant was not mentioned in the house survey as being a potential problem. "It's just like a forest. We just googled the plant and we realised what it was and what a problem this plant could be. "I've literally seen pictures of it growing up through people's floorboards," she added. But neither she, her neighbours nor the council were unable to take any legal action against the homeowner for several years. It was only when a new law came into force, called the Anti-Social Behaviour, Crime and Policing Act 2014, that the council was able to take legal action. The firm ignored a community protection notice in 2017, so it was prosecuted at Bristol Magistrates' Court. MB Estates Limited did not turn up at court for the hearing and did not respond to the council notice. It is believed this is the first time the law has been used in this way. "It's really encouraging that not only did the council prosecute on our behalf, we actually got a great result," added Ms King. The firm was ordered to pay costs in addition to the fine and has 28 days to comply with the order.